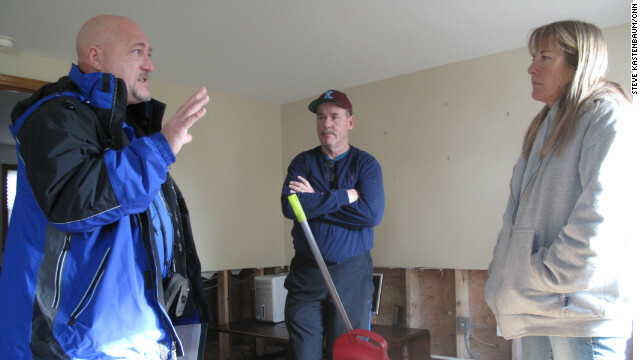 Allstate insurance adjuster Larry Steika (left) will be assessing Superstorm Sandy's damage for many months, maybe a year. (CNN) - One house at a time. That’s the only way for insurance adjusters to assess the damage from Superstorm Sandy. With over 300,000 homes damaged or destroyed in New York alone, the work will take many months, maybe a year. [:40] “The hard part is you want to get everybody like today. You want to make sure that everybody gets taken care of as soon as possible. You want to be there to just let them talk to you,” said Larry Steika, a member of Allstate’s disaster response team. On this day, Steika was inside John Kelly’s home in Breezy Point, a beach front community in New York City hit hard by the storm. Kelly has already started making repairs, but he needs a check from Allstate to complete the major work. Steika sometimes becomes emotional as he sifts through what’s left of a family’s lifetime in their home. He’ll have a long time to think about those families. Steika said he could be doing this work until next Christmas.